Aaj Hum Google Account Kaise Banaye ? Aur New Gmail id Kaise Banaye ? ke bare me janege. Gmail google ki free email service hai.Jisse aap email message send or receive kar sakte hai.Aap agar google ki koi aur service use karna chahte hai to aapko google account ki jaroorat padegi.Aap ek gmail ya google account se google sabhi service use kar sakte ho.sabse pahle hum google account kya hai uske bareme janenge. Google Accont Kya Hai ? Google Account Google ki ek free service se jisme aapko ek uniq id banani padti hai.google account se aap google ki free service gmail, google drive, blogspot, google sheet, google sites, google cloud, google forms aur bhi bahut kuch access kar sakte ho. Gmail ek free mail service hai.jisse aap kisi bhi ko mail send or receive kar sakte ho. aur agar aap kisi aur site pe sign up karte ho tab aapko email id ki jarurat padti hai uske liye gmail ka istemal kar sakte ho.matlab agar aap internet use karte ho to aapko gmail id ki jarurat padti hai.to ab new gmail id banana hai uske baare me janenge. Google Gmail Account Kaise Banaye Step by Step Jankari Hindi Me. Gmail Id aap do simple tarike se bana sakte ho.first tarike me pc se gmail id banane ka tarika hai. jisme aapko mobile number verify karna padega. dusre tarike me aap apne mobile se gmail account bina mobile number verify kare bana sakte ho. 1. Sabse pehle apne web browser me gmail.com open kare. 2. Now Create An Account Par Click Karen. Ab ek form open hoga.jisme mangi gai jankari bharni padegi. 1.First Name : Name me first me apna name enter kare.example : mera pura naam hai Devisinh Sodha. so first me Devisinh enter karna hoga. 2. Last Name : Last Name option me Apka surname enter kare. 5. Confirm Your Password : is option me dusri bar apna password confirm kare. 6. Birthday : is option me apni date of birth enter kare. 7. Gender : is option me aapka gender enter kare. male or female. 8. Mobile Number : is option me apna mobile number enter kare.mobile number sahi enter karen kyunki usi par apko verification code milega. 9. Your current email address : is option me agar aapka dusra koi email id hai to enter kare. agar nahi to is option ko chhod de. 10. Location : is option me india select karen. Pura form bharne ke baad Next Step Par Click Karen. 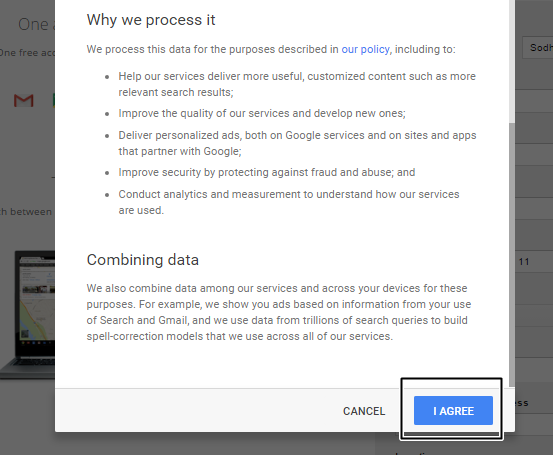 Ab naya Privacy And Terms Popup khulega jisme I Agree Button par click karen. Ab next page par aap se 6 ank ka verification code mangega vo aapke mobile number par ayega. use enter karen. Ab next page me Continue To Gmail par click karen. Bas Ban Gaya Apka Google Account. Next Apke Browser Gmail Open Hoga. Tip : Agar aapka internet connection slow hai to jab gmail loading ho raha ho tab Basic HTML par click karen jisse gmail jaldi open hoga. 1.Naye Ya Purane Received Mail Check Karne Ke liye Inbox Par Click Karen. 2.Aapke dwara bheje gaye mail dekhne ke liye Sent Mail Par Click Karen. 3.Save kiye gaye mail dekhne ke liye Drafts par click kare. 4.Delete Kiye gaye mails ko check karne ya hamesa ke liye delete karne ke liye Trash par click karen. 5.Koi mail receive hua par inbox me nahi mil raha ho to Spam me check karen. 6.Naye email message create karne ke liye Compose Mail Par Click Karen. 7.Contact List Check karne ke Contacts Par Click karen. 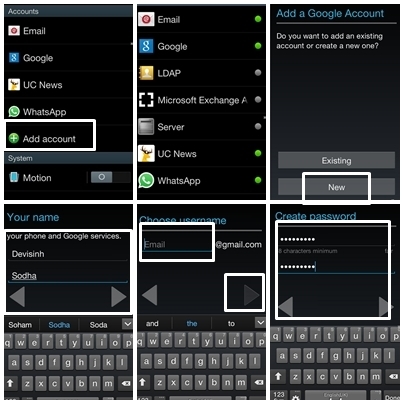 8.Password aur privacy ki setting change karne ke liye Account Par Click Karen. 9. Gmail ki aur koi settings change karne ke liye Settings Par Click Karen. 10. Apne gmail account se bahar ane ke liye Sign Out par click karen. 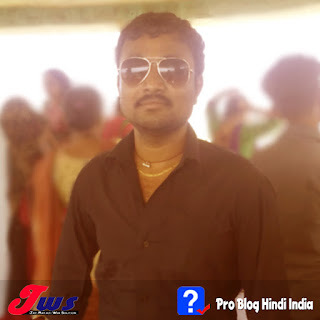 Must Read : 24 Best Online/Offline Paise Kamane Ke Genuine Tarike Hindi Me. 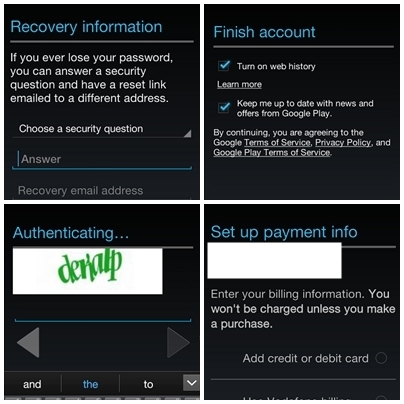 agar aap android mobile use karte hai to aap gmail id mobile se asani se bana sakte ho. 1. Sabse Pahle Menu me Settings Khole. 2. Settings me Acconts Me Add Account Open Karen. 3. Now Google Par Click Karen. 4. Ab Existing aur New me se New Option Select Karen. 5. Apna First Name Aur Last Name Enter Kare. 6. Next Apna Username enter karen. 7. ab aapka username available hai ki nahi wo check karega. 8. ab apna password create aur confirm karen. 9. ab koi bhi ek security question select karke uska answer de. 10. Finish Account Create me next par click karen. 11. Ab Captcha Challenge me captcha solve karen. 12. Set Payment Info me No Thanks Par Click karen. 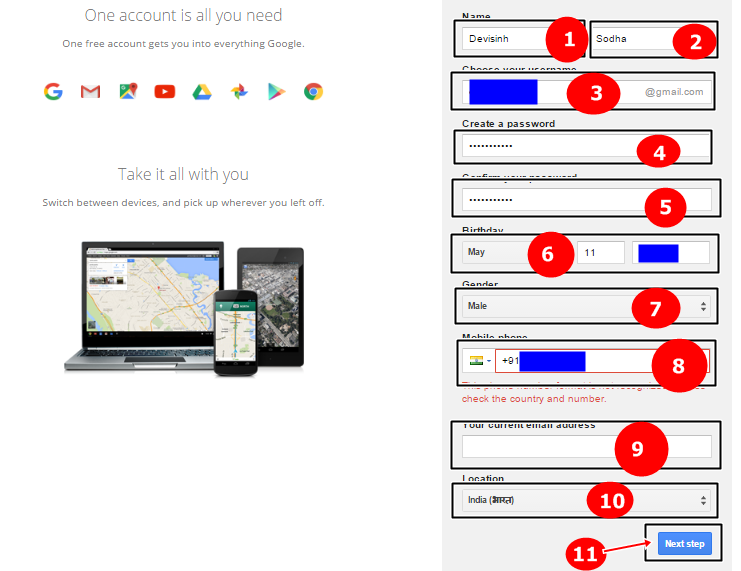 13. bas ho gaya aapka google account create. ab apne mobile me Gmail App install karke gmail use karen. 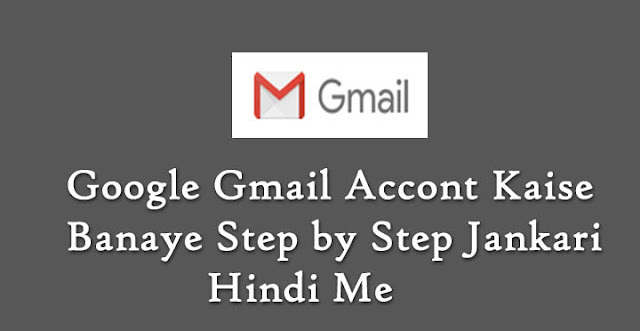 Thank For Reading Google Gmail Account Kaise Banaye Step by Step Jankari Hindi Me.agar aapko ye post kuch upyogi lage to ise jarur share karen.